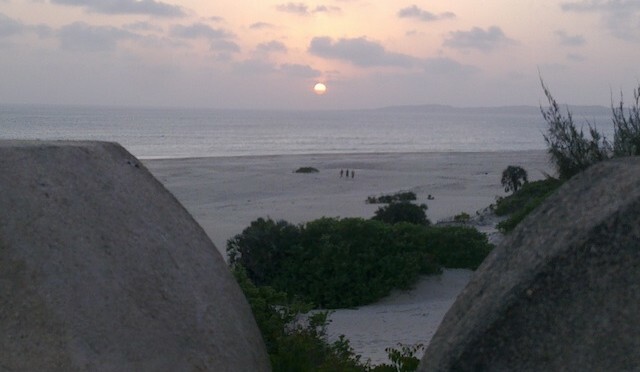 BBC Hub: Monday, November 5 saw the BBC launch their largest news bureau in the world outside the United Kingdom with Nairobi now being the home of the 300 of the network’s 600 journalists working in Africa. This is all part of the W2020 project that aims to increase the impact and reach of the BBC. Rachel Akidi, Head of East Africa Languages, said that in the last year, staff numbers in Nairobi has grown rapidly and significantly from 80 to 300 as several journalists who were familiar faces on local channels are now on BBC. The World Service team now produces 800 hours of new content comprising news, investigations, health, women discussion, sports, business etc, broadcasting in 12 languages, 6 of which are African, with the content distributed via TV, digital and radio. The day also saw the launch of a fourteenth local program called “Money Daily” and the BBC has also set out to tackle the problem of fake news with a dedicated new program about this that launches on November 19. Friday to Sunday has the highest TV viewership, in terms of hours consumed daily. But within a month, the period between the dates of from the 12th to the 25th of the month see the highest number of hours consumed. Live viewership of events (e.g. sports, award shows) result in a significant decline in watching traditional media e.g. news, feature shows. Reality TV is mainly watched live due to social media engagement. Wireless streaming does not work on all fixed wireless ISP’s in Kenya. It works over 3G and 4G, which offer a more reliable, but pricier, delivery model. Kwese Goes Digital: Kwese, the Pan-African digital channel, pulled the plug on its satellite broadcasting services as it announced a switch to focus on digital broadcasting its Kwesé Free Sports, Kwesé iflix and Kwesé Play. Kwese’s free to air service was in 11 African countries, but going forward viewers can download the Kwese app to their phones and subscribe for content, with Kwese iflix being free for 12 months. GAA: Several people including a current Member of Parliament (MP) and a former Permanent Secretary were charged with obtaining money by false pretences and fraud. This relates to a Government Advertising Agency (GAA) that was created a few years ago to handle all media advertising for the government. But for several recent months, leading media houses have been complaining about unpaid bills, with the Nation Media Group attributing its latest half-year profit dip to the Kshs 856 million (~$8.5 million) owed to it by the agency. This entry was posted in BBC, Investing in Kenya, Media in Kenya on November 7, 2018 by bankelele. WPP Scangroup and its subsidiary Russell Square Holdings (Russell) and have entered an agreement for the purchase of Russell’s 3,660 shares in Research & Marketing Group – a market research firm in Mauritius, that is owned by Russell. The shares represent 70% of the shares of the target firm and payment will be by way of 53.29 million shares of Scangroup which Russell Square Holdings (Russell BV) has subscribed for. It’s been a decade since the WPP deal to buy Scangroup and the new deal with Russell is meant to improve on client services at one of the largest marketing and communication groups in Sub-Saharan Africa. WPP owns 50.1% of Scangroup, and after the share deal valued at Kshs 926 million (~$9.26 million), will own 56.25% of the company. Scangroup shareholders must approve the deal and WPP will also seek an exemption from being required to make a formal takeover offer as their increased equity position is the result of the strategic investment in Mauritius restructuring their balance sheet. They also intend for the shares of Scangroup to remain listed at the Nairobi Securities Exchange (NSE). Scangroup reported revenue of Kshs 4.1 billion (from billings of Kshs 14.1 billion) compared to 2016’s revenue of Kshs 4.8 billion (from billings of Kshs 16.3 billion) and a pre-tax profit of Kshs 696 million (compared to Kshs 725 million in 2016). The decline was attributed to the economic crunch and prolonged electioneering period in Kenya. Revenue from outside Kenya also declined due to cutbacks by clients, while digital and public relations were bright spots, providing the greatest growth for Scangroup in 2017. WPP Scangroup was trading at Kshs 16.95 per share on the NSE today and the deal comes a few years after the group also bought into Ogilvy across Africa. Scangroup has a Mauritius company that is the holding company for other subsidiaries incorporated outside Kenya including STE Scanad DRC, Scanad Burundi SPRL, Scanad Rwanda, JWT Uganda, Scangroup (Malawi), Scangroup (Zambia), and Scangroup Mozambique. This entry was posted in M&A, Mauritius, Media in Kenya, NSE investments, Scangroup on April 26, 2018 by bankelele. A forum titled #whatsnextmedia was organized by Nest at the Aga Khan Graduate School of Media and Communications, in Nairobi yesterday. 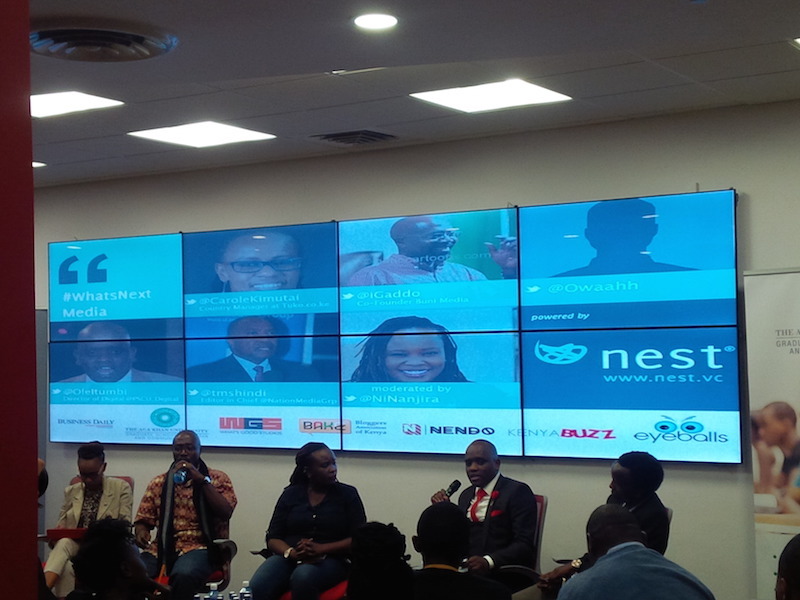 The first panel had Dennis Itumbi, Owaahh, Gaddo and Carole Kimutai. There was some nice chats about the current state of media, but it all came down to – what’s next in in media? They have to monetize continue – and they have just started to scratch the surface. Their sister site in Nigeria has 1 million views daily. A new website has give answers, as there’s too much content out there. People check ma3route every day as it gives enables them to make decisions like which road to drive on. Legacy media need to understand their audiences. Readers wants smarter delivery e.g. her Qz.com news app talks to her about the news they deliver. Young people are less informed and can’t answer simple questions. They don’t read, but love gossip – and they now have a gossip page that is very popular. Buni (producers of the XYZ show) contracts state that media owners cannot interfere with the program’s content. We should discuss media ownership in Kenya. The media is owned by the political elite and crooked people. The Kenyan president has been an observer of his online accounts, but in the next financial year (from June 30, 2016), that will change and he will become more interactive on his personal (ukenyatta) and official (presidentke) accounts. They have a digital verification hub at State House to confirm and respond to negative media stories. You can’t make content for revenue, and you don’t need 1 million readers. James Murua blog is very big in the literature community in Nigeria, even though not many Kenyans know it. And when you have a niche, you can monetize it. This entry was posted in ideaexchange, Investing in Kenya, Media in Kenya and tagged media, newspapers on May 26, 2016 by bankelele. Wednesday had M-Kopa launching a solar TV product & service in Nairobi. The 16-inch solar, flat screen, digital TV has 26 free channels and can be paid for at a cost of Kshs 50 per day, that can be spread out over two years. 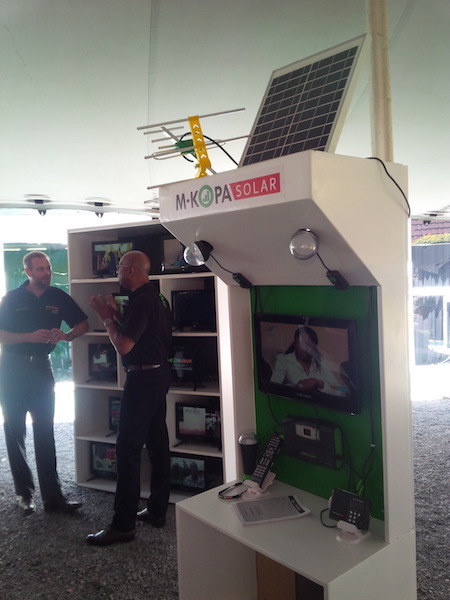 3-year old M-Kopa, which has over 300,000 customers, and targets to reach 1 million by the end of 2017, uses Safaricom’s M-Pesa to spread out the cost of their solar home equipment to as little as Kshs 40 per day to light homes, and charge phones and radios, effectively extending the hours that some businesses can operate. M-Kopa CEO, Jesse, said their goal is to be below the Kshs 50 per day that rural Kenyan homes spend on kerosene/paraffin. The company, which is also in Uganda and Tanzania, will for now only have the TV’s sold in Kenya and plans to move a few thousand units every month. Current M-Kopa customers, with good repayment records, will get calls from the sales team, and there will be excellent after sales service for the TV devices that are ready out-of-the-box. The TV is designed to provide homes with 4 hours minimum of TV viewing per day even if it’s rainy or cloudy. 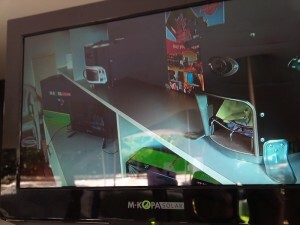 The TV components that M-Kopa uses are sourced in China, while the solar panels are now manufactured in Naivasha, Kenya, as the opportunity to do such manufacturing improved after the government removed an import tax on energy components. The TV is available in two ways: (i) As a “M-KOPA + TV” upgrade pack for existing M-KOPA customers or (ii) as a larger “M-KOPA 400” 20W home solar system with TV for new customers  Both products made affordable by convenient daily payment plans over M-pesa. This entry was posted in Media in Kenya, Safaricom, SME solutions, solar and tagged mkopa, solar on February 18, 2016 by bankelele.